Please note: The information about the Combe Ancestors has been retrieved from an Ancestral File on FamilySearch.org, which I have not personally verified. 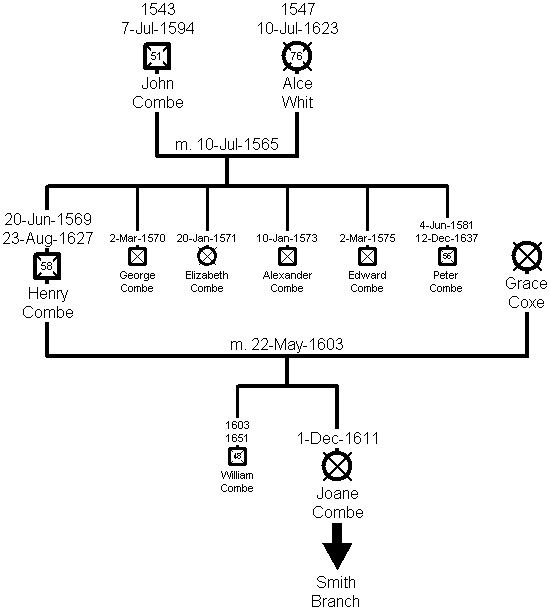 The earliest known Combe ancestor is John Combe, born circa 1543. He married Alce Whit on 10 July 1565 in Otterford, Somerset. They had six children all baptised in Otterford. The eldest, Henry, was baptised on 20 June 1569. John was buried in Otterford on 7 July 1594 and Alce was buried on 25 March 1623. Henry Combe was baptised on 20 June 1569 in Otterford, Somerset. He married Grace Cox on 22 May 1603 in Otterford. They had two children - a boy and a girl. The girl, Joane, was baptised on 1 December 1611 in Otterford. Henry was buried on 23 August 1627 in Otterford. Joane Combe was baptised on 1 December 1611 in Otterford, Somerset. On 22 June 1631 she married Henry Smith in Otterford. They had one child, also called Henry.